EMV (Euro MasterCard Visa) chip technology has evolved into the credit card processing industry due to major frauds that have taken place over the years in the USA as a means to reduce card present transactions fraud. The credit card associations have already implemented this secure microprocessor chip that is embedded into the credit card and allows for more information and applications to be stored onto the chip as opposed to the magnetic strip that has traditionally been used until now. The change has become almost mandatory for all businesses as of this past October 2015 and all banks have already started re-issuing new credit cards to their cardholders that have the EMV chip so that they are protected from fraud breaches. To learn more about EMV chip and to see if you absolutely need it. Please call us at 1-844-472-9264. EMV slot to “dip” credit cards as well as magnetic strip swiper. Set Custom tip amounts and tax rates. See your transactions on clover dashboard email or text receipts to your customers add and manage permissions for employees. Up to 200 swipes per charge and 100 EMV transactions. Strong and tight hold on device so that you don’t damage your phone or tablet or the credit card. Support and service you need from the global leader in reliable mobile swipe transactions. Digital line & land line for full range of connectivity and more longevity. Lightning Fast processor to process a transaction in seconds. NFC enabled and PCI PTS 3.X Certification, which allows you to accept Apple Pay, Samsung Pay and Google wallet payments by just waiving a smart phone in front of the terminal. Internal Pin Pad for debit cards and EBT cards. Maximum Security and compliance with encryption and VeriShield total protect. Sleek and slim lightweight design to occupy less room on your countertop. Vibrant Color 3.5” LCD screen touch display with vibrant color backed by VX evolution platform. Wireless GPRS, Wi-Fi/Bluetooth or 3G combo to meet any environment requirements. Built in thermal printer with graphics capability to handle debit and credit cards transactions. High Speed Powerful ARM11 processor. Built in thermal printer to handle debit and credit cards transactions. 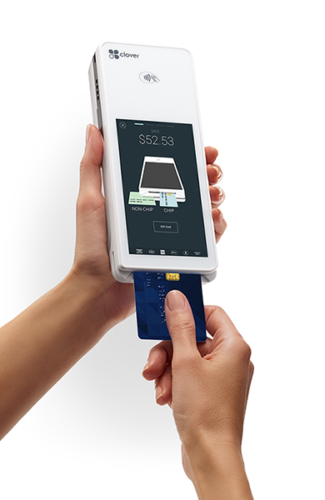 New Clover Flex wireless terminal brings the future of technology right into the palm of your hand. Allows you to process sales and transactions while you are on the go or on a delivery. Swipe or dip credit cards with EMV chip to provide you with maximum amount of security against charge backs & fraud. Printout receipts on the spot for physical customer signatures. Download additional Applications to provide your business with the most recent features without having to buy new devices. Beautiful new look and easy to handle rotating screen to process a sale and capture a signature easily. Get excellent customer service with amazing rates and look good doing it. All logos and/or trademarks are the property of their respective owners. Trademarks mentioned are not intended to represent or endorse. Payco Card is a registered ISO of Wells Fargo Bank, NA, Concord, CA, and US Bank Minneapolis, MN. Copyright 2016 Payco Card. 651 Coney Island Ave Brooklyn NY 11218 paycocard.com - All rights reserved.